n The Scorpio Races, contestants ride on bloodthirsty water horses, and the first to the finish line wins the grand prize. Sean Kendrick is the rider to beat, but Puck Connelly, the first female rider, keeps Sean on his toes. They both are playing for high stakes in this deadly race.I had not heard of the Irish myth about the water horses, but because I’ve read all of Stiefvater’s other books I wanted to give this one a try. When I first picked up the book, I couldn’t really get into it and so I put it aside. Later I found the audiobook at the library and thought that might be a better way to experience this book. The audio narrators are wonderful and their spirited reading kept me listening. The slow paced story does take patience to get through, but the reward is an exciting race with characters you come to care about.The story takes place in the made-up island of Thisby, and Stiefvater does a wonderful job bringing the island to life. It’s easy to envision the cliffs, the water, the colorful characters, and the mythological horses in Thisby. The race is all everyone can talk about in the month of November, and the promise of financial riches encourages riders to participate, even though the possibility of dying in the race exists.The story has a dual narrative with Sean and Puck trading off. Sean is calm and quiet, and is playing to win something of inestimable value to him. Puck is determined and full of life. She’s a reluctant rider, but financial circumstances drive her to compete. The pair becomes fond of each other, which complicates things.Sean and Puck have a low-key romance built upon their mutual respect for the horses and the island. It reminded me of Peeta and Katniss, where you don’t want either of them to lose the games/race. Theirs is a quiet slow-building romance that’s not the focus of the book, but helped me to get to know the characters better.Steve West and Fiona Hardingham narrate the audiobook. The lovely prose and nature of the story lends itself well to the audio format, and the narrators convey the right tone, rhythm, and emotion for the story. 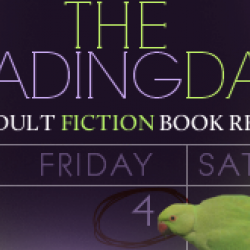 Maggie Stiefvater performs the music in the beginning and end of the audiobook and it is well suited to the story. In addition, the author speaks at the end of the audiobook about the years spent working on this book, and all of the research involved. She even created a stop-motion trailer for the book. 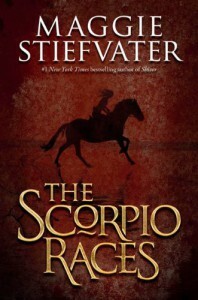 Check it out below.Though I’m not usually a fan of horse stories, The Scorpio Races is a unique read with great world building and characterization, and it is a fantastic audiobook.